Comments: This poster has the classic image of the brutal Hun grabbing a young girl during the sacking of Belgium. 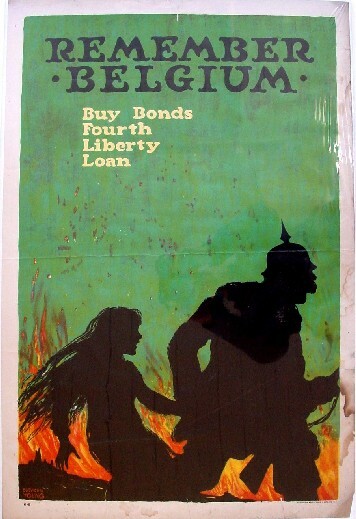 The German invasion of Belgium and its treatment of civilians was one of the great outrages of the World War I and this poster plays on that outrage to encourage purchase of war bonds. Condition: Shrink wrapped, right border water stains, edge tears a few of which go into image area.